You might have heard beauty boxes, fashion boxes, those food subscription boxes but i rarely got a chance to hear kid’s toys subscription and for a mother who prefers eco-friendly products it’s a great news to learn about the Little Pnuts. With their mission at hand and a big hope to get children back into imagination, creativity and play. Melissa, the brain behind this brand wanted children to find accomplishment in playtime again and with the right tools, families will get together again and leave behind the modern technology and engaged with one another creating a bond that they can treasure for a long time. With partner brands like glob, green toys, little sapling toys, Trudi, Wee Gallery , Hape, Tegu, Haba, and among other awesome toys brand, your kids will surely love this products. Checking out the different brands, i have found out that some of them are even European brands and one that even originated in Hongkong. Now, we don’t have to search the world to find the best green toys because Little Pnuts have done that tedious job for all the moms. Bringing the highest quality toys Little Pnuts is definitely a subscription you would not missed. What I love most about the idea is that they have Infant to Pre-school special delivery that features around 3 to 5 toys in every box. So, each box is specifically picked to meet your kids needs depends on their age and even some of them can be used from infant to their toddler years. Each delivery also include a newsletter featuring descriptions of the product, helpful expert advice, playtime suggestions, brand information and a way to provide feedback . 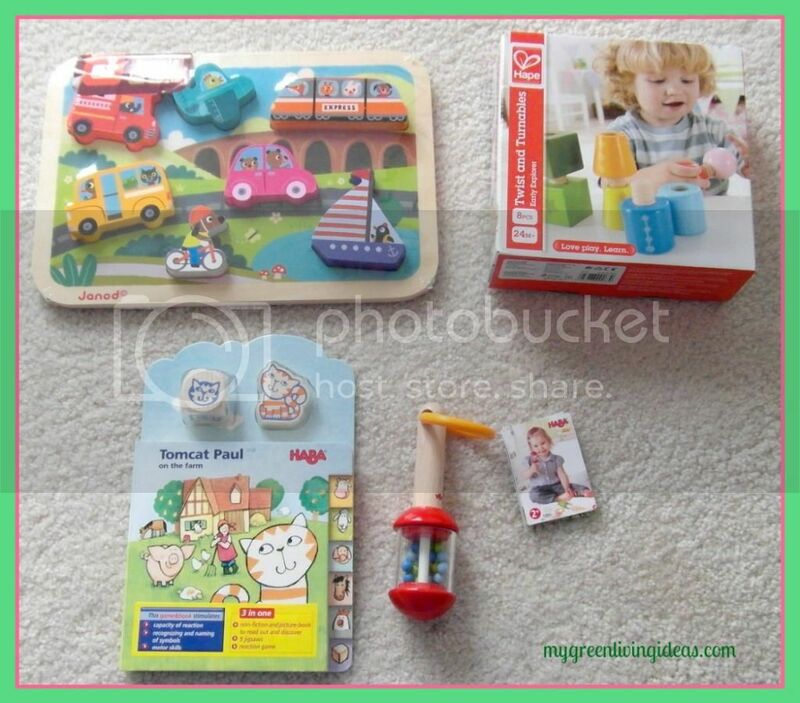 On our box, “Toddler Special Delivery – 2 years old “, we got these pieces of beautiful and awesome toys. You know how excited I was to get a chance to have them, so just imagine the excitement of my little boy when he sees them. all at $14.99 each. Imagine the savings you got since the subscription is only $25 monthly payment and has four (4) quarterly special delivery, March, June , September and December or you can also opt to choose to pay one time annual fee of $240, all of which with free shipping and what more lovely is the thought that all this products are eco-friendly toys. Since each boxes includes toys that fit his age, this would definitely help my boy on learning while he was playing. I always believe that learning and playing goes together and with guidance from us and right toys they would definitely had a good memory of their childhood. Learn more about Little Pnuts today and Follow them on Facebook and Twitter to learn more updates. this box is awesome. i will check them out. Those are nice things for the little ones! These toys are great for children’s supplementary learning and can surely excites them to play. I think these toys are awesome for kids;thanks for post. Wow my son would totally love all of this! I love that these toys are eco friendly and not only that they seem to last longer.With multiple kids lasting longer is a plus. I like the Vehicle puzzle. I love the box and will have to go check the site out. My grand kids would love this stuff. thanks for the post! I have very mixed feelings about “green toys”. I have gotten toys that look like they’re made from recycled paper and hemp and fall apart the first time my kids lay a hand on them. I have also gotten toys that are extremely well-made, heirloom quality, and stand up to years of play. These featured toys look like they are of the latter persuasion, well-made, quality toys that also happen to be eco friendly. Definitely a winner! Thanks! I think this is a good idea and what a great monthly “present” for kids! I don’t have any children and could never have any, so this wouldn’t help me at all. I will pass along to those with children. Would love to see more toys come in recycled pacakaging. love the toys,would be great to help kids learn. These toys appear to be very nice quality and ECO friendly is the BEST! Thank you for the blog an information. This is how we all learn about companies and what they offer. These are really cute toys! Anything that keeps me from having to go out shopping is an added bonus. Would make a great gift too!